I sometimes get the feeling that Amazon is always a step ahead of us. 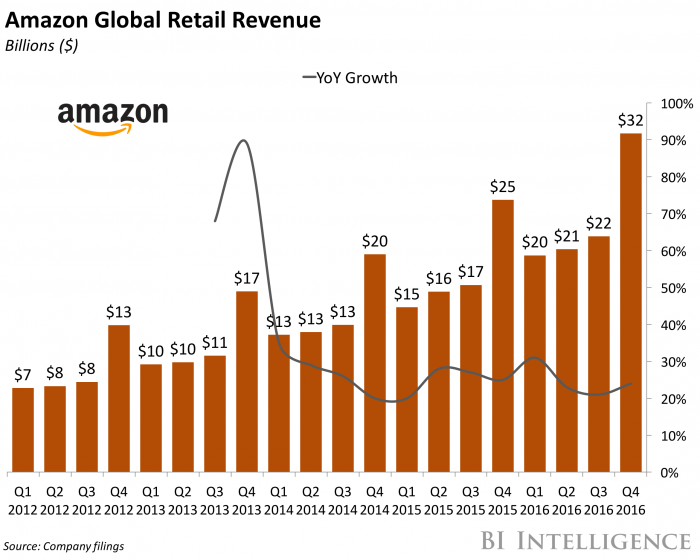 Why Amazon is eating the world says it is not just the switch to online retail, nor the astonishing growth in Prime memberships, reaching more than half of U.S. households. Hm, I just downloaded an Order History Report and see I have spent more than $100 on Amazon shipping for each of the past seven years running. I blanch at the thought of paying money for the privilege of shopping, but we use the Costco Executive 2% reward check to pay for our Costco Executive membership, so I should do what the math says. Oh wait, the free shipping promotion was in a separate column. Subtracting that out, I have never paid $100 for Amazon shipping in one year, I pay about $47 in an average year, including to third-party sellers. Why are so many people paying for Prime? Anyway, the reason Amazon is winning is because of its extreme dogfooding. each piece of Amazon is being built with a service-oriented architecture, and Amazon is using that architecture to successively turn every single piece of the company into a separate platform — and thus opening each piece to outside competition. Amazon has committed to this idea at a granular level. Even when it comes to services that can’t be sold, Amazon is still making a push to expose the services externally. The perfect example of this is Amazon’s Marketplace Web Service (MWS) API — this is the set of services that Amazon Marketplace sellers can use to programmatically exchange data with Amazon. Amazon built out a service that they call the “Subscriptions API,” which gives the seller instant notification of any price change by any competitor — including Amazon itself! Also, forget about the drones, Amazon now has an aircraft fleet.